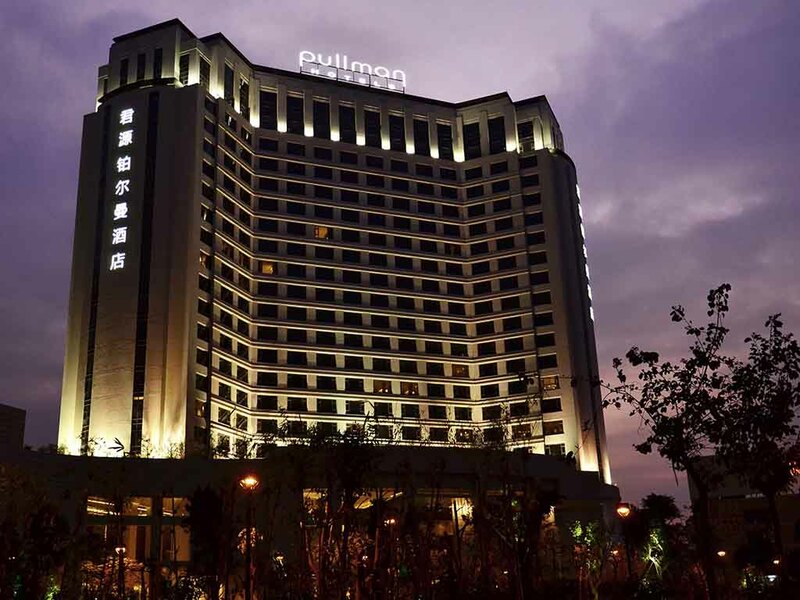 Pullman Dongguan Changan is the only international upscale brand hotel catering for business travelers in Chang'an Town. It offers 259 spacious rooms, three restaurants, two bars and one cigar & wine lounge, each with their own style. The hotel boasts a 1,700 m² pillar-less grand ballroom and five meeting rooms. With its high quality recreational facilities, the hotel provides business travelers with an ideal space to combine performance and enjoyment. Located at the heart of the Changan business park and close to the expressway, only 20 minutes drive from Shenzhen airport. The 259 spacious guest rooms offer 4 room types options. All guest rooms feature panoramic floor to ceiling windows with ample natural light. High speed Internet access and WIFI are available in all rooms. Total 550 seats which including 38 private rooms, brought to you by the famous master chef with experienced Cantonese cooking. Take Moto is born with the essence of the authentic Japanese traditional cuisine and incorporating a certain Mediterranean touch in order to obtain satisfying food pairing restaurant. This American styled bar serves various fine beverages and comes complete with a 'live' band. Comfortable to stay in your hotel. Will be even better if can improve your breakfast, especially western food area. My clients from Europe feel not much choice. fast check in, free upgrade, clean and quite, good dinner, and excellent breakfast! Overnight stay at the hotel. Arrived late, had breakfast and checked out. Everything went as expected. First, I'll said that the hotel room is spacious, but the bath room area need to improve and no replenish of toiletries for 1st & 2nd & 3rd nights, I'm called housekeeping to feedback on 2nd night, they said will replenish everyday. But 3rd night still "No". Feedback to front desk staff, they said will look into this case, but till check out, no people get back to me what happen. For bath room area, I'm stay for 4 nights, 1st night I tot that I'd turned on the water pressure too high that water leak out from the bath area and wet the bath room and no drainage for water to flow, then I need to use toilet paper to wipe it. 2nd night, I tried to turn the water pressure lower , water still leak out, no choice wipe the floor again. 3rd & 4th night still the same, release that the door unable to close it tide that caused the water leakage out. Hopefully, maintenance staff can look into this case. I've been staying with Pullman hotel for numerous years now, and have always been quite happy with the room and service. Always the best. I stay here 4-5 times per year and rooms and hospitality superb. Great Hotel for business traveler also. You have two great friendly, knowledgably, extremely helpful people at front desk with warm smiles - Vivian and Aaron. When you come to your room you see great welcoming flowers & treats for frequent guest - I am lucky to be one of them prepared by all specially Wendy - in charge of hose keeping with great support team consists of Lisa and Xu Yu Ping. Then you move to Urban Spoon food area with helpful people who remember your likings like Howard and York as well as the Chef. For a drink when you go to Lobby bar you will get efficient help with smile from Cindy. All has been possible for the mentor and the GM Richard Rennie - who has hand picked and trained how to best serve the guest. Thank you Pullman staff. Very clean and wonderful staff. Vivian and Aaron were very helpful. Nice rooms and restaurant. Great except for the temperature of the room. The room was too hot, especially at night. Nice room and amenities, food is OK. its a home away from home.